The most important person on your trip is your guide. Your support staff for climbing Kilimanjaro is made up of many individuals, but the most important person is the guy at top of the organization – the lead guide. His performance can make or break your trip. The lead guide is responsible for making all decisions with respect to the climb, including what pace to walk, when to rest, and when to turn a climber down the mountain. Guides are most often local Tanzanians (some international companies will fly in a western trip leader to lead the group in conjunction with local assistant guides). All guides are required to be licensed with the Kilimanjaro National Park. Licensing is obtained only after guides have gone through rigorous training, which includes classes in first aid and mountain rescue. Most Kilimanjaro guides are very experienced. The local guides start by working as common porters, climbing the mountain dozens of times per year. Through hard work, physical skills, leadership qualities and mountain intelligence, these porters are promoted through the ranks to eventually become a guide. This takes several years, at best, for the individuals showing the most promise. They should be able to identify and avoid potential dangers, especially altitude-related sicknesses. By the time one becomes a licensed guide on Kilimanjaro, guides have seen nearly every situation imaginable on the mountain. Depending on the size of the party, there may be one or more assistant guides. These assistant guides are responsible for helping the lead guide manage the climbers. Porters are the workhorses. They perform the most physically demanding job on the mountain. They carry the camping and cooking supplies for the entire group, such as tents, sleeping bags, food and water, cookware, gas, stoves, medical supplies, chairs, and tables. They also carry a good portion of the personal effects of the clients. Within the group of porters, there are those who perform additional duties. Cooks prepare the food for the entire party, while waiters serve clients food and water. What to look out for when selecting a guide company. 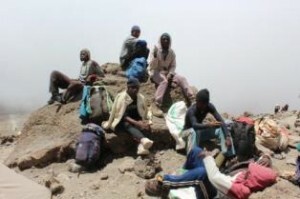 Historically, porters have been mistreated by climb operators. In the past, porters often were ill-prepared and ill-equipped to climb the mountain. They were insufficiently fed, improperly clothed, underpaid and over-burdened with loads. However, climb operators have made significant improvements in porter welfare in the past several years thanks to independent watchdog organizations such as Kilimanjaro Porters Assistance Project (KPAP). With guide company’s permission, KPAP monitors the company’s operations and their treatment of porters. If the guide company meets the standards set forth by KPAP, they become KPAP partner companies. The best Kilimanjaro operators are KPAP partner companies. Look for their logo when you research operators. It is VERY IMPORTANT that you only climb with KPAP partner companies. KPAP partner companies are guaranteed to: pay porters a decent wage, ensure porters have the appropriate gear and equipment, feed their staff enough food, and limit their loads. Other companies claim to do these things but it is impossible for you, the climber, to know what happens behind closed doors. Do not support Kilimanjaro companies that do not have the ethics to abide by these simple guidelines. There is NO REASON whatsoever, other than pure greed, that companies are not be able to provide for their porters. How do I Select the Best Kilimanjaro Operator?